Myles Richard Bass (born November 27, 1969), known professionally as Myles Kennedy, is an American musician, singer, and songwriter, best known as the lead vocalist and rhythm guitarist of the rock band Alter Bridge, and as the lead vocalist in guitarist Slash's backing band, known as Myles Kennedy and the Conspirators. A former guitar instructor from Spokane, Washington, he has worked as a session musician and songwriter, making both studio and live appearances with several artists, and has been involved with several projects throughout his career. While Alter Bridge was on tour in 2008, Kennedy and former members of Led Zeppelin met and improvised as a group in an informal jam session, but the band never fully materialized. He then started working with Slash, featuring on the guitarist's 2010 eponymous solo album on two tracks and later serving as Slash's vocalist on tour. With Slash, Myles Kennedy and the Conspirators have recorded three studio albums. Kennedy's debut solo album, Year of the Tiger, was released in March 2018. Kennedy was born as Myles Richard Bass on November 27, 1969 in Boston, Massachusetts, and subsequently lived in Northern Idaho. As a child, he moved to Spokane, Washington, where he grew up in a Christian Science family on a farm. His father, Richard Bass, died when he was four years old and his mother subsequently went on to marry a Methodist minister, and the family took the surname Kennedy. Before Kennedy attended Mead High School (which he attended with football player Jason Hanson and Everclear bassist Craig Montoya), he found musical inspiration from Led Zeppelin, Marvin Gaye, Stevie Wonder, and John Sykes' Blue Murder band. Kennedy began playing trumpet at the age of ten and was in a teen air guitar band with then best friends Michael Murphy, Mark Terzenbach and Bruce Kidd at 13. He later traded for a real guitar copying the playing style of Jimmy Page. He found his singing voice by listening to his parents' Marvin Gaye and Stevie Wonder records, and also states that he was influenced by Robert Plant. He played guitar in the school's jazz band and trumpet in the school's marching band. He also spent some time playing in a local heavy metal band called Bittersweet with some of his friends Zia Uddin on drums, Jason Stewart as lead vocal, Mark Terzenbach (and later, Chris Steffens) on bass and Myles on lead guitar. After graduating in 1988, he enrolled in Spokane Falls Community College to study music. I was just flattered beyond all belief to be in the same room with those guys. I mean, everything I ever learned about rock, I learned from Led Zeppelin. Just being near Jimmy Page was unbelievable. —Myles Kennedy, on his experiences with Led Zeppelin. Kennedy, a former guitar instructor, is also recognized as an accomplished guitarist. He began learning how to play the guitar by listening to Led Zeppelin records and mimicking Jimmy Page's guitar parts. He said in an interview, "I started off strictly as a lead guitar player. When I first started playing 25 years ago, that was all I’d do is sit in my room and learn solos." He also recalled being inspired by Eddie Van Halen: "When I was in my early teens, I heard 'Eruption' one day and was like, 'That is the most incredible thing I’ve ever heard,' and I begged my mother to give me an advance on my allowance for the next month and go buy that record." Over the next few years, and throughout the 1990s, Kennedy played primarily lead guitar. His early work with Cosmic Dust and Citizen Swing featured a jazz-influenced rock flavor, combining several advanced techniques used in jazz. He would later join Alter Bridge primarily as a lead vocalist, but began playing rhythm guitar on the band's first tour. Mark Tremonti said, "We knew Myles was an amazing singer, that’s why we hired him. What we found out when we toured the first record was that he’s also an incredibly gifted guitar player and songwriter, as well as a vocalist." Kennedy has been identified as an avid reader and he says that he especially enjoys the work of John Irving, describing Irving's A Prayer for Owen Meany as one of his favorite novels. He has also cited Effortless Mastery by Kenny Werner as one of his favorites. When asked about his hobbies, he replied: "I guess I have been pretty fortunate since I have turned what was a hobby into a living. Music pretty much consumes me. If I’m not writing, performing or listening I am probably trying to learn more about its history." He has five tattoos: a dragon on his left forearm, a koi fish on his right forearm, an octopus on his right upper arm, and two elephant heads on his chest. He describes the dragon and the fish as symbols of strength, while the octopus was originally supposed to be a small squid but became much larger than he had intended. He got the dragon tattoo first because of a toy he brought back from Japan as a child, and the koi was added a year later after he learned of an ancient Chinese legend of koi swimming up the Yellow River to become dragons. He has said he wants to get more tattoos in the future. ^ McGreevy, Ronan. "Myles Kennedy: The hardest working man in hard rock". The Irish Times. Retrieved February 5, 2019. ^ a b c d e f g h Julia Plummer (January 4, 2008). "Myles Kennedy Biography". Myles-Kennedy.com. Retrieved June 1, 2010. ^ a b "Myles Kennedy - Biography". IMDb. ^ "ListenIn.org Interview". Listenin.org. Archived from the original on September 19, 2011. Retrieved April 8, 2011. ^ a b Lasith Fernando (July 26, 2009). "5 Things You Didn't Know About Myles Kennedy". The Backdoor. ^ "Jim Templeton". World Jazz Scene. ^ Dave Turner. "Citizen Swing Official Home Page". The Turner Family. Archived from the original on April 29, 2010. Retrieved November 8, 2010. ^ "Cure Me with the Groove by Citizen Swing @ ARTISTdirect.com". ARTISTdirect. Retrieved June 1, 2010. ^ a b Doug Clark (September 9, 2001). "True story: Spokane rocker makes good". The Spokesman-Review. Archived from the original on February 22, 2013. ^ allmusic ((( The Mayfield Four > Overview ))) Allmusic. ^ "The Mayfield Four". Last.fm. Retrieved June 1, 2010. ^ a b "Official Biography from the Second Skin Release". The Mayfield Four Net. Archived from the original on January 12, 2013. Retrieved June 1, 2010. ^ Linda Laban. "Myles Kennedy Recaptures Youth for Movie Cameo". ABC News. ^ "Rock Star". Rotten Tomatoes. ^ "Interview: Myles Kennedy Of Alter Bridge". Entertainment Focus. October 26, 2010. Archived from the original on March 15, 2012. Retrieved June 1, 2010. ^ a b "Myles Kennedy Interview 5-07-10 Part 2". Myles-Kennedy.com. May 7, 2010. Archived from the original on May 23, 2010. Retrieved June 1, 2010. ^ Josh Bell (October 28, 2004). "Myles Kennedy gets the opportunity of a lifetime with Alter Bridge". Las Vegas Weekly. Archived from the original on July 14, 2012. Retrieved June 1, 2010. ^ Jenny Poust (September 9, 2004). "Crossing a New Bridge". Pulse Weekly. Archived from the original on September 13, 2012. ^ a b Doug Clark (November 26, 2002). "Dream called, but musician couldn't hear it". The Spokesman-Review. Archived from the original on February 22, 2013. Retrieved June 1, 2010. ^ a b Joe Bosso (November 30, 2010). "Interview: Myles Kennedy talks Alter Bridge, Slash and Led Zeppelin". MusicRadar. ^ "SLASH, MYLES KENNEDY Interviewed In London". Blabbermouth.net. June 25, 2010. Retrieved June 1, 2010. ^ Joe D'Angelo. "Life After Creed: Alter Bridge Look To A Stapp-Free Future". MTV News. Retrieved June 1, 2010. ^ C. Bottomley (August 23, 2004). "Alter Bridge: Many Rivers To Cross". VH1. Retrieved June 1, 2010. ^ "Gold & Platinum – 11/08/2004". Recording Industry Association of America. November 8, 2004. Archived from the original on September 24, 2015. Retrieved June 1, 2010. ^ "ALTER BRIDGE: Entire New Album Available For Streaming". Blabbermouth.net. October 9, 2007. Archived from the original on April 22, 2008. Retrieved June 1, 2010. ^ Alter Bridge. "Alter Bridge - Live From Amsterdam - OUT NOW USA/Canada". Archived from the original on January 14, 2011. ^ a b Alter Bridge (September 8, 2010). "New Alter Bridge - AB III - Bio". Alter Bridge's blog. Archived from the original on September 11, 2010. ^ Florino, Rick (October 12, 2010). "Alter Bridge "AB III" Review — 5 out of 5 Stars Review". Retrieved October 12, 2010. ^ "Alter Bridge Wembley DVD Release Dates Announced". Fret 12. January 4, 2012. Archived from the original on July 14, 2012. ^ "Official Site". Alter Bridge. November 1, 2016. Retrieved March 6, 2017. ^ a b c "Myles Kennedy (Alter Bridge, Slash) interview". MusicRadar. July 13, 2010. Archived from the original on December 25, 2010. ^ a b c Joe Bosso. "Interview: Myles Kennedy talks Alter Bridge, Slash and Led Zeppelin". MusicRadar. ^ "Report: ROBERT PLANT Says No To LED ZEPPELIN World Tour". Blabbermouth.net. March 2, 2008. Archived from the original on February 4, 2010. Retrieved June 1, 2010. ^ "Led Zeppelin trio back in studio". BBC News. August 26, 2008. Retrieved June 1, 2010. ^ Steve Sauer (November 10, 2008). "Source: Page, Jones, Bonham watch Alter Bridge in London; DVD filming postponed". LedZeppelinNews.com. Archived from the original on April 5, 2016. Retrieved June 1, 2010. ^ "LED ZEPPELIN Members To Tour With ALTER BRIDGE Singer?". Blabbermouth.net. October 8, 2008. Archived from the original on February 21, 2009. ^ Joe Bosso (November 10, 2008). "Mark Tremonti says Myles Kennedy "deserves" Zeppelin gig". MusicRadar. ^ a b "ALTER BRIDGE Singer Says Jamming With LED ZEPPELIN Members Was 'Surreal' (See video)". Blabbermouth.net. January 20, 2009. Archived from the original on May 2, 2012. Retrieved June 1, 2010. ^ Steve Sauer (December 16, 2009). "Exclusive interview: Myles Kennedy thrilled to have written with Zeppelin members". LedZeppelinNews.com. Archived from the original on June 12, 2010. Retrieved June 1, 2010. ^ Johnny Firecloud (May 6, 2011). "Talking with Myles Kennedy". Food Republic. Retrieved March 6, 2017. ^ "Myles-Kennedy.com's exclusive interview with Myles Kennedy". Myles-Kennedy.com. January 8, 2009. Archived from the original on April 22, 2009. Retrieved June 1, 2010. ^ Myles Kennedy (November 14, 2009). "I'm in the studio making my record". Kennedy's blog. Archived from the original on February 7, 2009. Retrieved June 1, 2010. ^ Myles Kennedy (February 2, 2010). "Still in the Womb". Kennedy's blog. Archived from the original on February 7, 2009. Retrieved June 1, 2010. ^ a b Rob Laing (July 13, 2010). "Myles Kennedy (Alter Bridge, Slash) interview". MusicRadar. Archived from the original on December 25, 2010. Retrieved June 1, 2010. ^ a b c Johnny Firecloud (February 2, 2011). "Myles Kennedy of Alter Bridge". CraveOnline. Archived from the original on February 7, 2011. ^ "MYLES KENNEDY Doesn't Know When SLASH Will Get Around To Making Another Solo Album". May 5, 2017. Retrieved December 2, 2017. ^ "Davy Knowles & Back Door Slam Headline Benefit for Cancer Patients at The Johns Hopkins Kimmel Cancer Center Hosted by Paul Reed Smith". PRS Guitars. 2009. Retrieved June 1, 2010. ^ Alter Bridge (September 16, 2009). "Myles Kennedy Live and Acoustic at Bofest '09". Alter Bridge's blog. 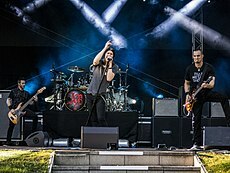 AlterBridge.com. Archived from the original on January 6, 2010. Retrieved June 1, 2010. ^ "Myles Kennedy details solo album Year Of The Tiger". December 1, 2017. Retrieved December 2, 2017. ^ Slash (November 4, 2009). "Slash updates fans on Twitter". Twitter. Retrieved June 1, 2010. ^ "SLASH Taps ALTER BRIDGE Singer For Solo Album". Blabbermouth.net. November 6, 2009. Archived from the original on November 9, 2009. Retrieved June 1, 2010. ^ Chris Vinnicombe (March 4, 2010). "Slash solo album interview: the track-by-track guide". MusicRadar. Retrieved June 1, 2010. ^ "Slash: Solo Album's Artwork Revealed". Ultimate Guitar Archive. February 1, 2010. Retrieved June 1, 2010. ^ Joe Bosso (February 7, 2010). "Slash picks Alter Bridge's Myles Kennedy for solo tour". MusicRadar. ^ "ALTER BRIDGE's MYLES KENNEDY Talks About Collaboration With SLASH". Blabbermouth.net. June 5, 2010. Archived from the original on June 8, 2010. Retrieved June 1, 2010. ^ "SLASH To Tour With OZZY OSBOURNE In January?". Blabbermouth.net. September 21, 2010. Archived from the original on September 25, 2010. Retrieved June 1, 2010. 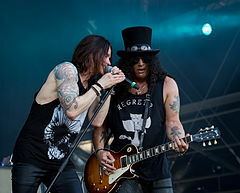 ^ "MYLES KENNEDY Will Continue Touring With SLASH Throughout 2011". Blabbermouth.net. September 22, 2010. Archived from the original on February 1, 2013. Retrieved June 1, 2010. ^ "SLASH Announces Lineup Change In His Touring Band". Blabbermouth.net. March 26, 2010. Archived from the original on June 11, 2010. ^ "VH1 Classic's Original Hit Series 'That Metal Show' is Back for a Sixth Season Complete With a Heavy Roster of Rock Icons". The Futon Critic. October 4, 2010. ^ "SLASH: 'Made In Stoke - 24/7/11' Concert DVD and Blu-Ray Due In November". Blabbermouth.net. September 7, 2011. Archived from the original on September 8, 2012. ^ "SLASH's Next Album To Feature MYLES KENNEDY Handling All Vocals". Blabbermouth.net. November 21, 2010. Retrieved June 1, 2010. ^ Joe Bosso. "Interview: Slash talks Ozzy tour, Velvet Revolver and next solo album". MusicRadar. ^ "SLASH: More Details Of New Solo-Album Recording Sessions Revealed". Blabbermouth.net. November 30, 2011. ^ Bryan Wawzenek (February 7, 2012). "Slash's New Album Due May 22". Gibson Guitars. Archived from the original on March 10, 2012. ^ Kory Grow (February 16, 2012). "Slash Announces New Album, 'Apocalyptic Love,' and Reveals Cover Art". Revolver. ^ "Slash Previews New Song 'You're a Lie'". Loudwire.com. February 23, 2012. ^ "Myles Kennedy Took Drugs To Aid Songwriting Skills". Contactmusic. November 23, 2011. ^ Jordan Zakarin (April 16, 2012). "Guns N' Roses Perform at Rock and Roll Hall of Fame Induction with Myles Kennedy in Axl Rose's Absence". The Hollywood Reporter. ^ "Slash reveals release date, track list + artwork for third solo album 'World on Fire'". Loudwire. Retrieved May 27, 2014. ^ "Slash Releasing New Album 'Living the Dream' This September, Tour Announced". Retrieved June 18, 2018. ^ "The Pleasure and the Greed". Atlantic Records. ^ "Myles Kennedy > Credits". Allmusic. ^ "10.21.06 Spokane, WA - The Big Easy". October 21, 2006. Archived from the original on May 18, 2007. ^ "Aerosmith, Deep Purple, Alter Bridge Members To Guest On Tommy Bolin Tribute Album". Roadrunnerrecords.com. Archived from the original on March 10, 2011. Retrieved November 6, 2011. ^ "Tommy Bolin Tribute Album Includes Peter Frampton, Derek Trucks, Warren Haynes, Brad Whitford, Steve Lukather and More". VVN Music. January 18, 2012. ^ "UGLY KID JOE Frontman's RICHARDS/CRANE To Release Debut Album In May". Blabbermouth. February 23, 2016. ^ a b Rick Landers (January 27, 2011). "Myles Kennedy Interview: PRS Guitars, Alter Bridge and Slash". Guitar International. Archived from the original on February 17, 2011. ^ "Myles Kennedy Interview 5-07-10 Part 2". Myles-Kennedy.com. May 7, 2010. Archived from the original on September 25, 2010. ^ a b "Interview with Myles Kennedy of Alter Bridge". Music Equals Life. ^ "Alter Bridge - Myles Kennedy". ^ a b c "Myles Kennedy's Top Secrets". Jaime Vendera. Archived from the original on July 13, 2011. ^ Brian Christopher (December 24, 2008). "Myles Kennedy, Hallelujah". Music-Live-Reviews. WKBT-DT. Archived from the original on July 18, 2011. ^ a b Lupe Galvan. "Myles Kennedy Interview with Lupe Galvan". Myles-Kennedy.com. Archived from the original on January 29, 2013. ^ "Official Ron Anderson website". Ronandersonvocals.com. Archived from the original on August 26, 2011. Retrieved November 6, 2011. ^ a b "SLASH Says Singer MYLES KENNEDY Is 'F**king Amazing'". Blabbermouth.net. September 14, 2010. Archived from the original on February 1, 2013. Retrieved June 1, 2010. ^ Tim Grierson. "Alter Bridge on About.com". About.com. ^ "Universal Republic Community". Universal Republic. ^ "Mark Tremonti: 'I Always Want To Create Music And Do The Best I Can'". Ultimate Guitar Archive. November 28, 2008. Archived from the original on July 17, 2011. Retrieved February 13, 2011. ^ Steve Sauer (November 11, 2008). "Myles Kennedy holds his own on guitar". Lemon Squeezings. Archived from the original on July 13, 2011. Retrieved December 5, 2010. ^ JP Stroman (January 28, 2010). "Under the radar: Mayfield Four album retains edge, punch". The Cavalier Daily. ^ Jonathan Geddes (October 14, 2010). "MUSIC: An Altered image". Evening Times. ^ Kennedy, Myles (2010). "Losing My Religion: Alter Bridge Frontman Myles Kennedy Tackles Life's Big Questions on New Album AB III". Kerrang! (November 2010): 7–8. ^ Polly Glass (July 16, 2014). "Religion: Myles Kennedy - Classic Rock". Classicrock.teamrock.com. Retrieved March 6, 2017. ^ Rick Florino (April 10, 2012). "Reading List: Myles Kennedy of Alter Bridge and Slash & The Conspirators". Artistdirect. ^ *Please enter your name. "It's Myles Kennedy's Tattoo!". Loudwire. Retrieved March 6, 2017. ^ Inked Australia/NZ (November 26, 2013). "Alter Bridge: Myles Kennedy - Inked". Inkedaustralia.com. Retrieved March 6, 2017. ^ "About Us – Future Song Foundation". futuresong.org. Retrieved December 2, 2017. Wikimedia Commons has media related to Myles Kennedy. This page was last edited on 12 April 2019, at 04:23 (UTC).